Pancake Day on Tuesday 28 February will see the old bowling green area opposite the Kings Arms Hotel in Christchurch transformed into a race track as chefs, business people and local celebrities grab their frying pans and toss their way to victory in the pancake races. Meanwhile there will also be a pancake race in Wimborne. 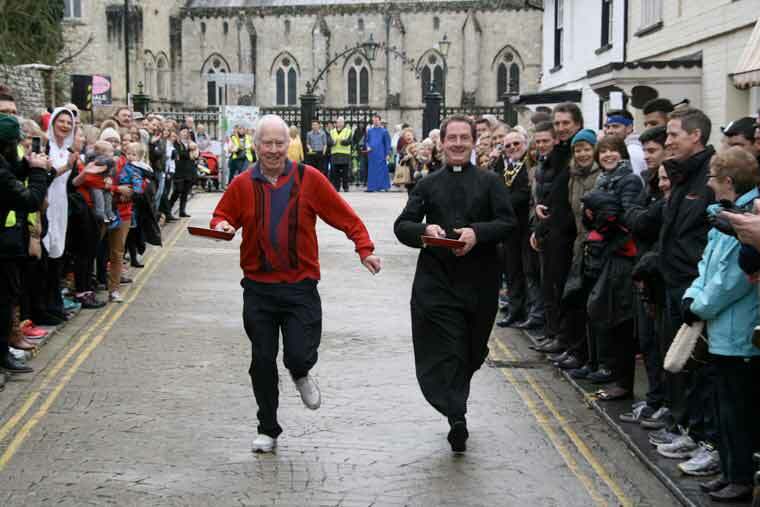 The Pancake Race around the Minster is all set to run again this year and will be the twentieth race since it was revived in 1998, after an absence of some 16 years. The race takes place on the same day as the Christchurch one at 11am and the venue is outside the main entrance to the Minster. The first heat will be run whilst the Pancake Bell is tolled. All competitors should report to the North Porch by 10.30am to enrol, complete with frying pan and ready cooked pancake. Entry forms are available in the Minster or Church House (Parish Office), or just turn up on the day. Book in for registration by 10.30 am.